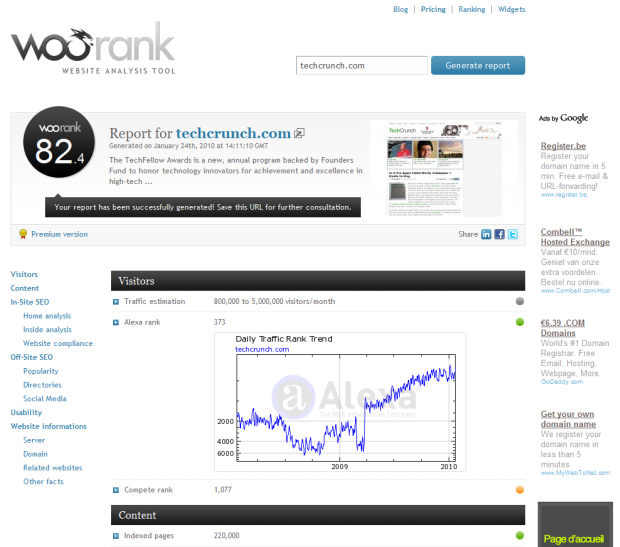 WooRank is a brand new service designed to let website publishers and marketers evaluate the SEO-friendliness and other aspects of their Web sites on the fly, free of charge. If this reminds you of what HubSpot built with its Website Grader tool, it’s because the concept is extremely similar. WooRank evaluates Web sites based on 50 criteria in an automated fashion, free of charge, and provides helpful SEO and other tips. A premium version will be offered in about 3 months: for a yet-to-be-determined fee, publishers and marketers will then be able to screen Web sites based on up to 120 pre-defined critera, get served more personalized tips as well as references to online tools that they can use to increase the findability and performance of their Web sites. Update: site seems to be down or at least terribly slow due to our coverage, so hang in there. I gave the tool a spin and generated a report for beta.techcrunch.com – turns out we’re worthy of a WooRank of 82.4. While I have absolutely no idea what that means exactly, according to these statistics we’re well above the average. In the overall ranking, we even made the top 50, ahead of sites like the Apple Store, MySpace, ESPN.com and NYTimes.com (take that, New York Times, we haz bigger WooRankz!). Apparently, we need to work on our headings, immage attribution tags, meta description and keywords, XML sitemap(s) and other aspects like Web standards compliance. We score pretty well on content (number of indexed pages), off-site SEO (particularly on the social media level) and website usability and load time. Frankly, that’s a lot of valuable information available free of charge, so I’ll be curious to know in a couple of months how WooRank will try to entice people to pay for more detailed information and improvement tips. WooRank was built by fellow Belgians, namely digital marketer Jean Derély of BetaGroup and the founders of interactive agency 1MD.be. Since soft-launching the service a couple of days ago, 27,000 reports have already been generated by some 7,500 visitors. For more online tools, check out Website Grader but also HitTail and LotusJump.